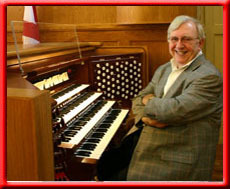 Harald Rohlig was world-renowned among organists not only as a player and composer but as an organ designer. “I think of the organs as my children, and I've got them all over the country,” he said. 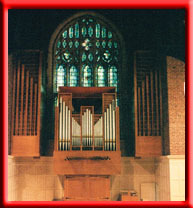 One of his favorites is the organ he designed for the college’s chapel in 1965 It returned home in November of 2000 after a two-year restoration project that doubled its size. 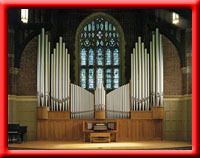 His last large organ was designed for St. John's Episcopal Church, completed and installed in 2006. Now fully installed and tuned, the beautiful instrument is a culmination of and a tribute to Dr. Rohlig’s career. That career began when Harald Rohlig was a small boy in Germany. At the age of five, he began taking violin lessons. Obviously very gifted, his mother took him to hear a performance of Johan Sebastian Bach’s Mass in B Minor, which was performed at St. Mary’s Cathedral in Osnabruch. The beauty of the music so enthralled and captivated him that he remembers being physically ill for two weeks after the performance. He told his mother that music was what he wished to do with this life. 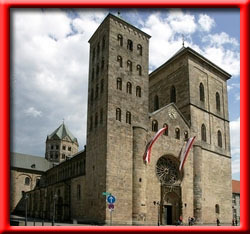 Years later the family moved to Osnabruch and Harald had occasion to play at the Cathedral many times. But Hitler had other plans. As Rohlig practiced piano and violin, Hitler’s forces were eliminating Jews in Germany. One week his piano teacher was among those taken away. Soon after, his violin teacher was taken. His father was a United Methodist minister in northwest Germany who was opposed to Hitler’s messages, but when the family’s water, utilities, and access to groceries were systematically cut off, Harald had no choice but to join the Hitler Youth. He was ten years old. While Harald was a young teenager, his father was imprisoned at the Bergen Belsen concentration camp for preaching a sermon on obeying God before man. 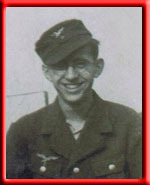 Harald, who had been a child prodigy on the violin before an elbow injury interfered with his playing, was drafted into the air force in 1943 at age 17 and served as an anti-aircraft gunner during WWII. Just before the war ended, Lt. Rohlig and his men were captured by American forces but traded to the French. 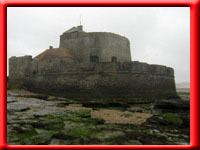 He spent most of the next three years imprisoned in a 17th-century fortress on the French side of the English Channel located in the small coastal village of Ambleteuse, south of Calais. The Germans had laid great numbers of land mines along that coast, and who better to clear them than German prisoners-of-war? “There were no metal detectors,” Harald recalls. “You were given a sharp instrument called a pique to push into the ground. If you were careless or you fainted and fell on a mine, you had what they called a cigar-box funeral. I came close to having one myself.” There were 100 men in the camp; 36 died the first year. The German military had abandoned the fort in 1945, allowing the French to use it as a POW site. It was a twisted, wrenching time, the son fighting for Germany while the father languished in a concentration camp, then the father liberated by the Allies and the son imprisoned by them. Released in 1948, Harald resumed his musical education at Osnabrück Conservatory in Germany and as an exchange student at the Royal Conservatory of Music in London. At Osnabrück Converatory, he met Ingeborg, who would become his wife, herself an accomplished violinist. Eager to come to America, his father advised him to take out an ad in The Christian Advocate, a Methodist publication, seeking a position with a church in the states. He received many offers. 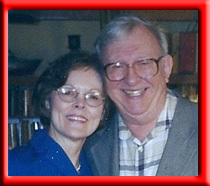 In 1953, one week after they wed, the Rohligs made their way to the small town of Linden, Alabama, where Harald had secured a position with the First United Methodist Church as minister of music and organist. Two years later, Harald joined the faculty of Huntingdon College in Montgomery where he taught for over fifty years. Upon his retirement in 2005, he remained as Professor Emeritus and continued to teach until 2012. His wife Inge passed away in 1999 after an extended illness. 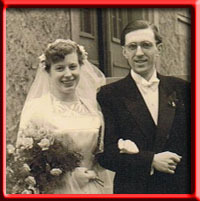 In 2005, Harald and Jeanette Lynn were married. A former organ student from the early 1960's at Huntingdon, they met again in 2002 after a service at St. John's. Rohlig has performed hundreds of concerts, written more than 1,000 organ and choral pieces of music, published more than 500 of his own works, and won every teaching award the College offers. He has been recognized six times with American Society of Composers Awards. In 2000, he was named Educator of the Year among all United Methodist-related colleges and universities by the United Methodist Foundation for Christian Higher Education. Those who have crossed his path say that, when it comes to organs and church music, Rohlig may be the world's best. He has played at, and composed for, the world’s greatest churches, including Canterbury, Washington National, Cologne, Notre Dame de Paris, and Westminster Abbey.